If you’re here, it is no secret to you that we are not living sustainably. That’s led to serious problems (see this post), but we know how to solve these problems?! 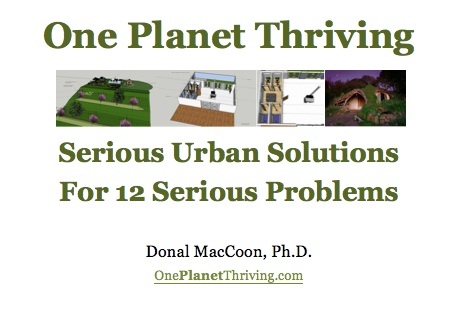 Click the button below to get immediate access to your copy of the 50-page eBook that reviews 5 urban solutions for 12 serious problems. (3) a way of transitioning from urban status quo to one planet thriving by contributing to solutions for 12 serious global problems, including: Deforestation and habitat destruction, soil problems (erosion, salinization, fertility), water problems (quality and availability), overhunting, overfishing, effects of non-native species, population growth, increased per-capita impact of people, climate change, buildup of toxic chemicals in the environment, energy shortages, and full use of Earth’s photosynthetic capacity. That’s pretty good for a simple solution, right? I agree. There are obstacles and challenges to work out. But, here’s a good place to start. And, what’s great about the internet is that if you have questions, comments, or suggestions, you can leave them here. Be part of improving this thing. Start by clicking the button below to receive your copy of the 50-page eBook on serious urban solutions for 12 serious problems. This post has been read 1050 times. This entry was posted on October 12, 2014 by dmac.